For best flavor and tenderness, harvest shelling and sugar snap peas when the peas have just reached full size. Overly mature peas will be starchy. Harvest snow peas while pods are still flat, just as the seeds start to form. Cook peas as soon as possible after harvesting, because conversion of sugars to starches will continue even after harvesting. Pea plants can be either bush (18-24 inches tall) or vining (3-6 feet tall). Vining types require support and generally produce for a longer period. Bush types don't strictly need support but a modest support can help keep the peas off the ground. Provide thin supports that pea tendrils can clasp (e.g., string, thin wire) rather than thick supports such as stakes or bamboo. Provide good sun exposure and air circulation to reduce incidence of powdery mildew. Little Marvel (shelling), OP Heavy yields of fine-flavored peas on vigorous plants. Heirloom variety. Best on a short trellis. 3–4' tall. Plant 4" apart. Tall Telephone (shelling), OP Large pods of delicious peas on tall vines. Heirloom variety. Needs a trellis. 6' tall. Plant 4" apart. 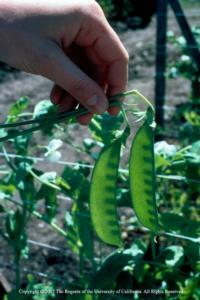 Mammoth Melting Sugar (snow pea), OP Heirloom variety with sweet 4–5" long flat pods are borne on vigorous vines. 4–5' tall. Plant 3–4" apart. Super Sugar Snap, OP Vigorous vines yield a heavy crop of delicious, edible-podded sugar snap peas. Healthy and mildew resistant. Thick, juicy pods are great raw or cooked. 5–6' tall. Plant 3–4" apart.